Impact NW, Heffernan, and Philadelphia Insurance staff sorting coat for walk-in clients. This year marked a visible increase in the number of coats donated—so much that the two insurance businesses rented a 10-foot truck for transportation to our walk-in center! Over 250 coats, and nearly 1,000 hats, scarves, shoes, and scarves were donated by the two local organizations. Philadelphia and Heffernan start collecting coats in June each year. 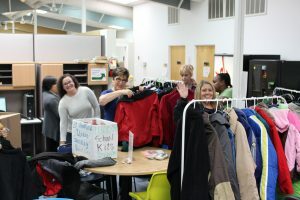 The organizations box, bags and sort the coats by size, keeping an ever-growing inventory until the coats are transported to Impact NW’s Dancing Tree Family Center in East Portland. Thank you to both of these terrific companies for being so dedicated to our community!